Nonprofit auto insurance provides coverage for the vehicles you own. This includes coverage for liability associated with at-fault accidents: bodily injury to other people or damage to other’s vehicles or other’s property. It can also include coverage for damage to your vehicles. You can also include coverage for accidents involving uninsured or underinsured drivers. You own a vehicle: State laws and lenders mandate coverage on vehicles that you own. There will be a claim: Vehicles account for the majority of insurance claims in the United States so your organization needs to be well protected. Other Services: Your organization might want to take advantage of other services such as driver training and vehicle monitoring programs often provided as part of your nonprofit insurance program. A vehicle owned by food bank made an unsafe lane change into a passing vehicle, which then went off the highway and crashed. The driver and passenger in the other vehicle both made injury claims and retained an attorney. Over a three-year period, each claimant incurred more than $60,000 of suspect medical treatment. By the time a court-ordered mediation was held, the claimants had fired two attorneys and hired a third. Demands at mediation were for more than $500,000, and the claims eventually settled for a total of $80,000, but not before incurred $170,000 in defense costs were incurred. A nonprofit’s employee was traveling on agency business in a car owned by the nonprofit and was rear-ended by an uninsured motorist. The crash was severe, pushing the nonprofit vehicle into the vehicle ahead. The employee’s neck and back injuries were serious and required two surgeries over an eight-year period. While workers’ compensation paid more than $200,000 in medical and disability benefits, the employee was also entitled to additional economic and non-economic damages under the vehicle’s uninsured motorist coverage. Those claims were settled for $350,000 without the need for litigation. A nonprofit vehicle entered a highway after stopping for a stop sign. The driver failed to notice a motorcycle traveling down the highway, which had no stop sign and the right of way. The motorcycle crashed and the rider was injured. The claim was eventually litigated. The injuries were serious and damages included a loss of income claim. The claim settled for $160,000. Defense expense costs, however, were more than $75,000. Nonprofit Hired & Non-owned Auto coverage provides liability coverage above and beyond your employee’s or volunteer’s personal auto coverage. When you have employees or volunteers who drive their own vehicle on organizational business you can be held accountable for claims and lawsuits associated with at-fault accidents. Simple Errands: You may not have employees or volunteers driving regularly but they do probably run errands to the bank or post office sometimes. If employees or volunteer drive anytime for any reason on behalf of the organization you are at risk. Excluded from Volunteer Protection Laws: The state and federal volunteer protection laws exclude any claims that deal with vehicles. 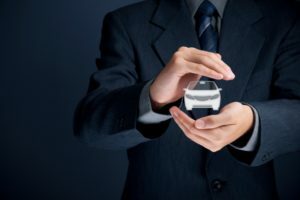 You need these drivers and their cars: If your organization relies on employees and volunteers using their own vehicles to deliver your services or transport clients then this is the only way to be fully protected. An insured’s employee driving his own vehicle to the bank to make a deposit and was involved in an at-fault, catastrophic collision. Unbeknownst to the nonprofit, the employee’s personal auto coverage had lapsed. The non-owned coverage become the primary coverage,. The full $1,000,000 in available limits were paid in a settlement which involved a structured annuity to take care of the injured claimant over his lifetime. The executive director of a sheltered workshop was driving to a meeting with a major funder. She was in a hurry and accidentally ran a red light striking a pedestrian. The pedestrian’s medical bills exceeded $750,000 and she sued for lost wages and permanent disability. The executive director only had a $300,000 liability limit on her personal auto policy, so the organization’s nonowned auto policy paid the remaining damages. A volunteer of a senior services organization dropped a senior off at a medical clinic. When backing up to leave he hit a pole on the portico of the building causing damage to the pole and the roof support. His own auto policy only covered $5,000 of the damages so, the organization’s non-owned auto liability paid the remaining $15,000 in property damages.